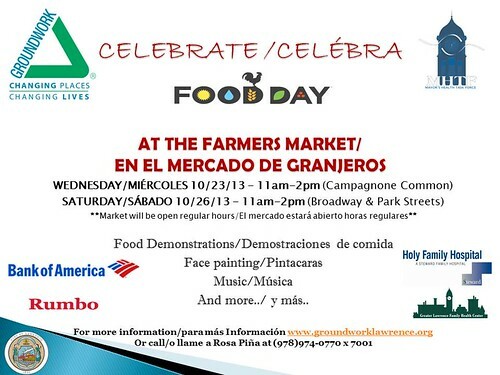 Wednesday, October 23, 2013 11 am- 2 pm at Campagnone Common and Saturday, October 26, 2013 11 am- 2 pm at the corner of Broadway and Park Streets. It's time to celebrate the connections happening all over the city engaging students with local food! Groundwork Lawrence's Glow Gala is just around the corner! We hope you will consider joining us on Thursday, November 14th for the unique event which features live music, a cash bar, and delectable food from Two Chefs are Better Than One. 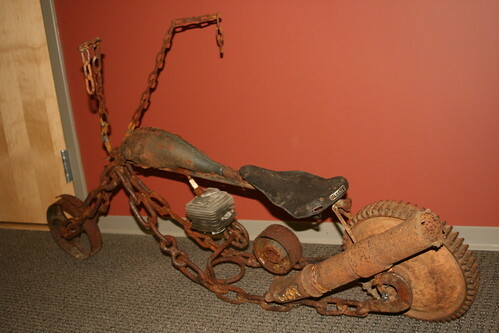 Local artists, both professional and amateur will once again be auctioning off their EcoArt (Deadline this Friday). There will also be fabulous raffle and silent auction items to be had including a Microsoft Surface RT Tablet as well as sports tickets, a night stay at the Lenox Hotel, tickets to the Boston Ballet and more! Tickets are $60 in advance or $70 at the door. You can also purchase chance raffle and Microsoft Surface RT Tablet raffle tickets in advance as well as during the event. In addition we have a variety of sponsorship opportunities available! If you have any questions or would like to learn more, please contact Amanda. 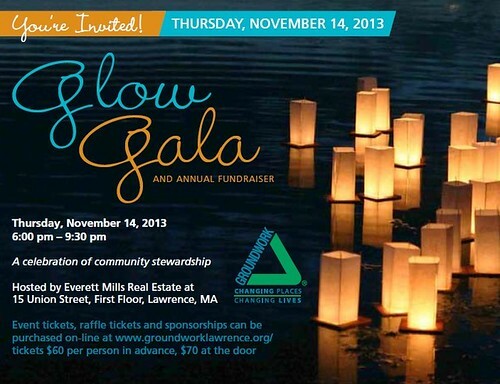 Glow Gala 2013 will be held at Everett Mill, 15 Union Street, First Floor, Lawrence MA. Free Parking is located at the rear entrance of the mill. Access the parking lot from General Street. The entrance is marked by a large, wooden wheelchair ramp. Join us for Food Days at the Farmers Markets! National Food Day is October 24 and this year GWL is hosting celebrations at our weekly farmers markets. Wednesday, October 23 at the Campagnone Common and Saturday, October 26 at Broadway & Park Streets from 11 am-2 pm there will be cooking demonstrations, face painting, music and more! The farmers market will also be open for its regular hours (Wed.: 10 am-5:30 pm; Sat. : 9 am-3 pm) at each location. Come celebrate Food Day with Groundwork Lawrence!